Happy Zombie » Blog Archive » Multi Denominational Winter Greetings! What should have taken me a day… took me a week. 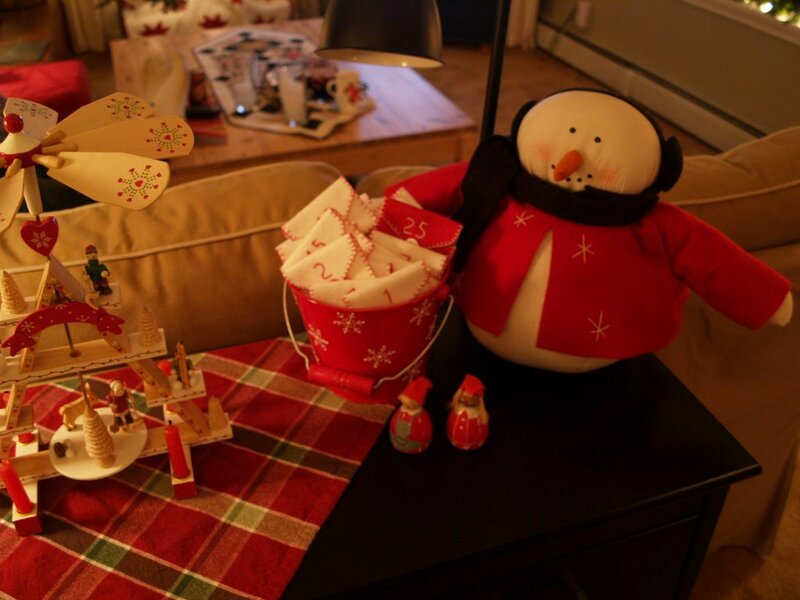 I love to decorate for the holidays… I just hate doing it. 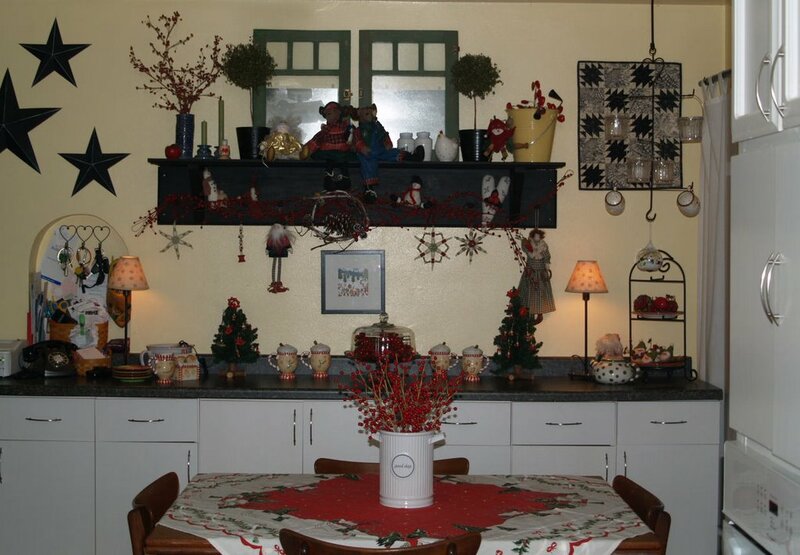 I’ve been hesitent to post these photos as they make my home look crappy and cluttered. But hmmm… what IF my home really IS crappy and cluttered… and I just now noticed it! Oh well… I guess you’ll have to stop on by for a Kaluha & coffee visit and see for yourself! For starters… this is our tree. A real tree! We have an artificial one, but this year it’s staying in the attic. My DH got this as a gift from a very nice Oregonian who gives trees each year to service folks (police, fire, military, etc)… his way of saying Thank You. I do not know this man’s name (not for a lack of trying) and wish I could thank him for his kindness. If you know who this is… please shoot me a comment! Anyhoo… At our house there is no particular religion, we just kind of celebrate everything that suits our fancy (within reason of couse!). We’ve always had a Star of David on top of our tree, and I’m not alone… check out PAMKITTYMORNING’s tree! See… we really are twins separated at birth! So here’s a shot of what looks like Clutter Central. This photo is especially poignant for me as I’ve not seen this table since the day after Thanksgiving when I stared stacking all my Christmas stuff on top of it. Last night my table reappeared! I guess this means I have to cook dinner again. Our little buffet counter is somewhat clutter free too. This is where cell phones, laptops, cameras and everything else that needs charging lands. It’s where one of the few available electrical outlets is in this old house. Tahdahhhh… I finished my Allsorts inspired Christmas pouches. “Pouches” still isn’t doin’ it for me… and “envelopes” sounds so office cubicle… must think of another word. Any ideas? Anyhoo… Wende had a great idea about doing it red, so I made the 25th in red. I like it! Thanks Wende! So the question is… what to put in them. Since DS is 15, little stickers or candy just won’t do. I’m putting one dollar bills in them and a $20 on the 25th. Oh I’ll have some fun too… some days DS will get a quarter to keep him humble. Bad mom, bad mom. I thought it would be fun to do little homemade coupons too. My kitchen window. I don’t know what it is, but I always seem to photograph this! I have more rooms, really. My swag looks so nice lit up and it has this nice glow. A flash photo makes it too bright… and no flash makes it look dark and dreary as like if we lived in, umm, Oregon! Notice the Star of David??? DS2 made that when we lived in Hawaii. And what does a kid in Hawaii make a Star of David from??? Chopsticks of course! I have another photo of my popsicle stick SoD that my DS1 made a couple of decades ago… just like the one PKM’s daughter Frankie made… but Blogger is being a [insert your own colorful word here] and won’t let me upload it. DS1’s Star of David is not neon like Frankie’s because Al Gore hadn’t evented it yet when DS1 made his. Oh… and remember when I said there was no religion in our house? I lied. I faithfully attend my Swedish House of Worship, especially on the two holiest days of the year in July and December. Merry It Only Happens Twice a Year Sale! Yes it is me! I love all the photos! It looks all cheery and I look forward to helping myself to coffee from that carafe on the counter there.. I mean why make you get up all the time! Looks really fun and you won’t be surprised when I tell you I have a giant red star over my fireplace like your blue stars by the kitchen table! Love your post - and love your cluttered house! If your house is cluttered then so is mine. I love to collect things I love, and I love to display them. No one cares but me - but that’s all that counts. I hope to have a grandchild that loves to collect things too. What a fun post! Your house looks so cozy and inviting. 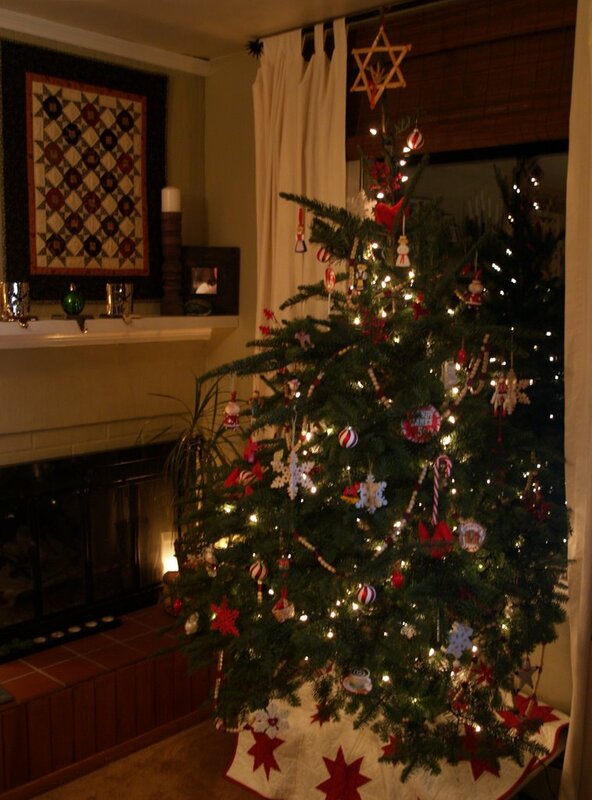 :D I like that tree skirt… did you make it? 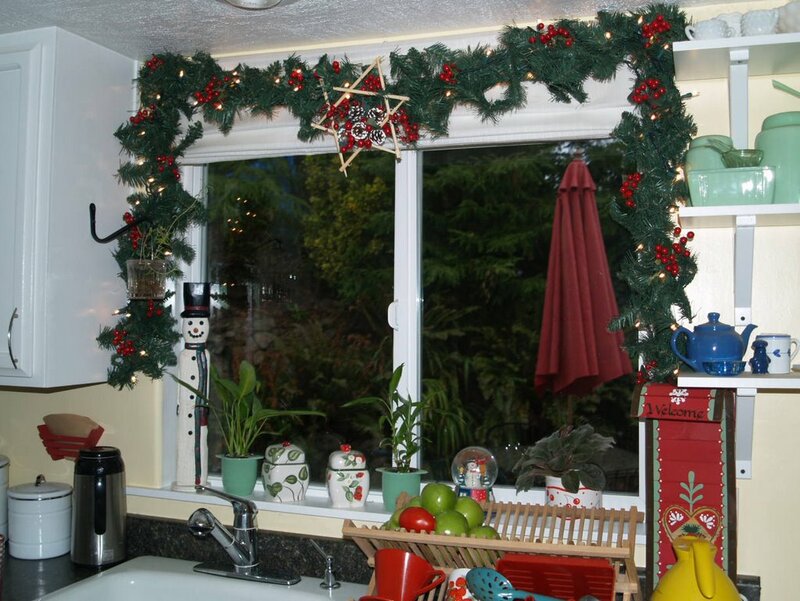 Your Christmas house looks so cute ` not cluttered at all. Very Christmasy. Love the colors you’ve used in your kitchen (heeheehee)! Great idea for the advent pockets. My kids would so be fighting over opening them! I have been in your house, and it is anything BUT cluttered, it is well merchandised with all your lovies! You are a fab decorator, along w/all the other fab talents that you have. psha! I LOVE being in your house. It’s like one of those great gift shops that you LOVE going in and spending hours looking at every little thing, even tho you never buy anything. :) Oh, and the IKEA bug really made me sad. Thanks! tee hee Our IKEA is in Minneapolis ~ about 5.5-6 hours away. ouch. Cheater cheater replacing your tree photo like that. What? A new photo? Moi… switch a photo?